Got a spare power outlet? You can extend your Wi-Fi range. Even if you have a powerful router, you may find that the signal gets a bit ragged at the outer edges of its range. The TP-Link RE450 range extender picks up the edge of that original signal and uses three built-in antennas to re-broadcast it at full strength. There's even an intelligent signal locater light that helps you find the ideal place to plug it in. So far it is working great. I am using 2 of the TP-Link RE 450 in 2 different houses. Both are working well. We installed in December 2017. Very easy to install. Only downside is that it is big. We had one in our dining room and had to move it because people bumped into it. 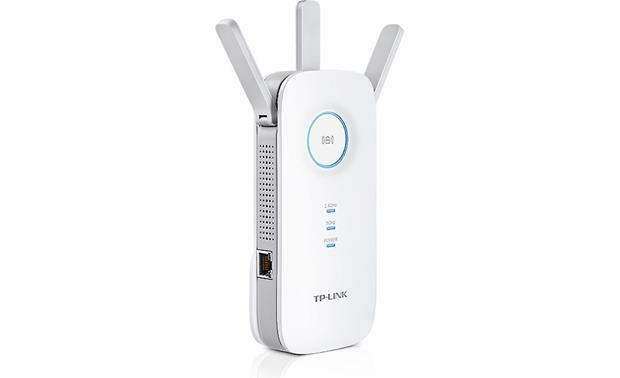 WiFi Range Extender: The TP-Link RE450 WiFi Range Extender connects to your existing WiFi router wirelessly, strengthening its signal and expanding its coverage (up to 1,000 sq/ft) into areas that could not otherwise be reached. The WiFi range extender also reduces signal interference to ensure reliable WiFi coverage throughout your home or office. Dual Band WiFi (802.11ac): TP-Link's RE450 comes with next generation 802.11ac WiFi technology which is 3x faster than the standard 802.11n speeds. The RE450 delivers fast speeds of dual band WiFi up to 1750 Mbps (450MBPS on 2.4GHz and 1300Mbps on 5GHz), providing reliable connections for bandwidth-intensive tasks like HD/4K streaming, lag free gaming, large file downloads. High Speed Mode: High Speed mode maximizes overall performance by combining the bandwidth of both the 2.4GHz and 5GHz channels to create a lightning-fast connection with one band sending data and the other receiving. 3 External Antennas: Three external dual band antennas (3 x 2dBi for 2.4GHz / 3 x 3dBi for 5GHz) boost your wireless coverage and reliability, helping your devices stay connected anywhere your network reaches. The WiFi range extender has a wireless range of up to 1,000 sq/ft. WPS or Web Browser Setup: There are two ways to connect the RE450 WiFi range extender to your wireless router - via WPS or via a web browser. If your router is equipped with a WPS button, use the WPS method to connect the WiFi range extender to your network - this will be the simplest method of connection. If your router does not have a WPS button, then use TP-Link's web browser tool on your computer to connect the WiFi range extender to your router and network. Tether App: The Tether app (for Apple iOS 8.0+ and Android OS 4.3+) provides a simple, intuitive way to access and manage the RE450 WiFi range extender with your compatible mobile device. Gigabit Ethernet Port: A gigabit Ethernet port turns the extender into a wireless bridge, letting you connect a wired device like a Blu-ray player, gaming console, DVR, or smart TV to your WiFi network. Intelligent LED: The Intelligent signal light can help your find the best location to place the extender between your router and your "dead" zone. Built-In AC Plug: The TP-Link RE450 WiFi Range Extender is outfitted with a male two-prong AC connector to plug directly into an AC wall outlet. 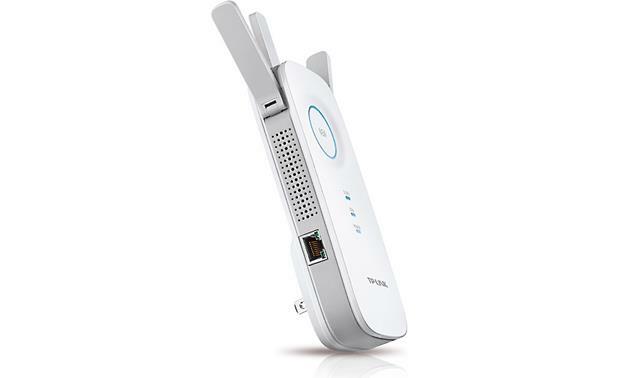 Searches related to the TP-Link RE450 Wi-Fi® Range Extender 802.11ac Dual Band Gigabit (AC1750).